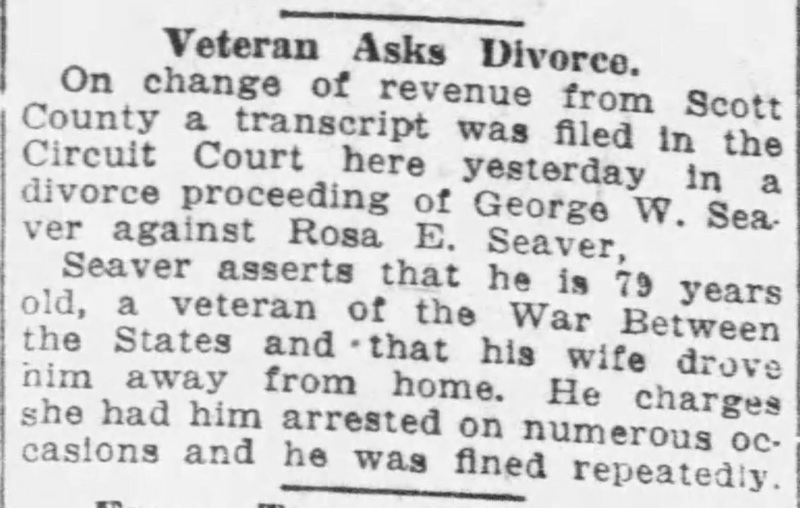 It's time for another edition of "Seavers in the News" - a weekly feature from the historical newspapers about persons with the surname Seaver that are interesting, useful, mysterious, fun, macabre, or add information to my family tree database. "TOWNSEND, July 5 -- Everett W. Seaver, a native and former resident of this town, died Saturday of a cerebral hemorrhage at the home of his daughter, Mrs. Vernon Saunders of Westerleigh, Staten Island. He was 79 years old and is survived by two daughters, Mrs. J. Edward Seaver of Boston and Mrs. Vernon Saunders of Westerleigh, two granddaughters, Lucile and Nancy Saunders, and several nephews and nieces. "Funeral services were held at the home of his niece, Mrs. John T. Hurley Monday afternoon and a large gathering of the townspeople united with the relatives in their last tribute of respect. "Burial was in the family lot at the Hillside cemetery. A delegation from North Star lodge, I.O.O.F., escorted the body to the grave and conducted the burial service of the order. The bearers were Timothy Flarity and George Wilder of the Center and Herman L. Stickney and Fred A. Patch of West Townsend. The floral tributes were profuse. The flag at the Town hall was at half mast as a tribute to Mr. Seaver's long service in town office. 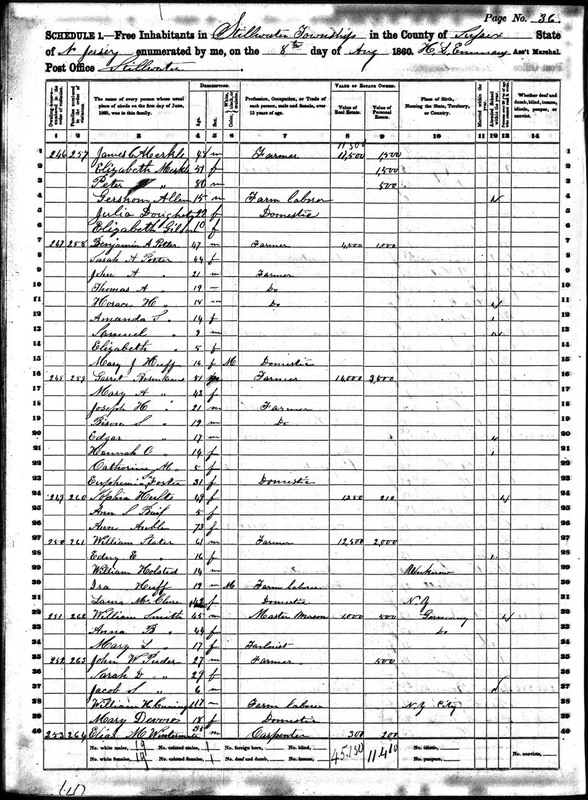 "Mr. Seaver was the son of Abram and Charlotte (Scales) Seaver and was born at Townsend Feb. 15, 1844. Most of his early life was passed here. He learned the cooper's trade and in 1874 removed to the West, where he was employed as a cooper 12 years. Upon returning in 1886, he, with his brother, the late G.A. Seaver, engaged in the manufacture of tubs and pails about 15 years. Later he was employed in Boston a few years and on his return to town made his home with his niece, Mrs. John Hurley, until three years ago, when he removed to his daughter's home. "During his long residence here he held the office of selectman many years. He also served on the school board a number of terms as well as in minor offices. In the West Townsend Lyceum he held prominent positions and was a well known debater and speaker of that organization for many years. He was a man of scholarly attainments, a lover of the best in literature, a broad-minded student of the questions of the day and a writer whose pen was always ready in the defense of law, order and justice. He was a member of North Star lodge, I.O.O.F." "Last Rites for Everett Seaver," The Fitchburg [Mass.] Sentinel newspaper, article, Thursday, 5 July 1923, page 14, column 4, Everett W. Seaver obituary; Newspapers.com (https://www.newspapers.com : accessed 18 April 2019). This obituary is full of personal history information, including parents, children's spouse's names, cause of death, occupations, and civic activities. * Sarah Wilner Seaver (1882-1947), married John Edward Smith (1861-????) in 1921. * Grace L. Seaver (1886-???? ), married Vernon Saunders (1892-????) in 1917. Everett Wilner Seaver is my 6th cousin 4x removed, with common ancestors of Robert and Elizabeth (Ballard) Seaver. I have him in my RootsMagic database, but need the death dates of his wife, a daughter and a son-in-law. More research opportunities! Disclosure: I have a paid subscription to Newspapers.com and have used it extensively to find articles about my ancestral and one-name families. "HIS LIFE BROUGHT SUDDENLY TO A CLOSE YESTERDAY. "WHILE ADDRESSING THE GRAND JURY IN JERSEY CITY, HE FELL BACK FROM THE BENCH AND SOON EXPIRED -- SKETCH OF HIS CAREER. "Supreme Court Justice Manning M. Knapp ended a long service on the bench by dropping dead in the Hudson County Circuit Court room on Jersey City Heights yesterday afternoon. The Judge had been ailing more or less for two or three years. The precarious state of his health necessitated a long vacation last Fall that extended into the opening of the December term of the county courts. He was on hand, however, to receive the Grand Jurors when the term commenced. It was noticed that he failed to deliver to them one of his usual vigorous and caustic charges on the condition of public affairs and the prevalence of public vices throughout the county. It was assumed that this lapse was due to his conviction that, as all of his previous commands that Grand Jurors do their duty proved fruitless, there was no use of his saying more to them. The belief is general now, however, that he was forced to abstain by the condition of his health. "The failure of the present Grand Jury to indict Cronheim, the Hoboken dive keeper whose frequent arrests for giving Sunday entertainments have been reported in these columns , served, however, to arouse all the Judge's latent energies, and when the Grand Jury went into court yesterday afternoon to make presentments and report progress, he was prepared to lecture them for their dereliction. When the members had ranged themselves in front of his bench in the courtroom he denounced them roundly for their refusal to take cognizance of the proofs in this case. "Once before, he said, Cronheim had been indicted and had pleaded non vult. That was his confession of guilt. The testimony taken in a more recent habeas corpus case that had involved Cronheim's place was sufficient to have convicted him if he had been on trial, and he declared himself astonished beyond measure that the Grand Jury had not found an indictment. "The court, the Judge added, felt particularly sensitive over these repeated protections of violators of the law, because in the public mind the court itself was involved in the imputations, though it had no control whatever over the Grand Jury. There was once a time when a charge to the Grand Jury was heeded, and he wanted to know if this time no longer existed. Then he picked up a bundle of manuscript and held it in view of the inquest. "The Judge became ghastly pale and gasped for breath. Before Judge Lippincott could reach him he had fallen back in his chair unconscious. The excitement in the courtroom became intense. Grand Jurors and tipstaves and spectators pressed forward toward the bench, while Judge Lippincott, assisted by one or two lawyers, carried the suffering jurist into his private chamber. When they had laid him on the sofa they felt for his pulse and listened for heart beats.
" 'I fear he is dead!' said one as he turned with a despairing air to the throng that was trying to push its way into the room. Messengers were hastened in all directions for medical aid. Dr. Rhodes, who was the first physician to arrive, saw at a glance that the end had come and that the stricken Justice was beyond the reach of medical skill. Dr. Noble dashed in a minute or two later. He said that death had resulted from a ruptured blood vessel. "The remains were removed to the late home of the deceased at Hackensack. "Judge Knapp had been on the bench of the Supreme Court of the State for seventeen years. He was a native of Newtown, Sussex County. Born in 1823, he was in his sixty-ninth year, but his wonderful mental acumen and his springy, elastic step indicated a much younger man. He was admitted to the bar at the July term in 1846, and was made a counselor in 1850. He quickly acquired a large practice and attracted attention by his success in the conduct of several important cases. In 1875, Gov. Bedle appointed him to the Supreme Court bench. Gov. Ludlow reappointed him in 1882, and in 1889 Gov. Green signed his third commission. Soon after his appointment by Gov. Bedle the Supreme Court Justices assigned him to the busy Hudson County Circuit, which Bedle had vacated to accept the Chief Magistracy of the state. "Judge Knapp was a widely-read man and an enthusiast in other studies than the law. He was specially interested in the mysteries of the heavens, and at his home in Hackensack had one of the most complete telescopes in this part of the country. He was scarcely up to the medium height, but he had a massive head, and the classic mold of his features was a subject of frequent remark. "The Grand Jury was to have considered the Guttenberg race-course scandal yesterday. Judge Knapp had prepared to make that the topic of a special charge. His death prevented its delivery. "Judge Knapp leaves a wife, daughter of Capt. Joseph Mattison of the navy, and a son and a daughter, the latter being the wife of Walter V. Clark of Hackensack." "The New York Times, 1851-1980," online database, The New York Times (http://query.nytimes.com/search/ : New York, N.Y., accessed 27 April 2008), issue of 27 January 1892, page 1. 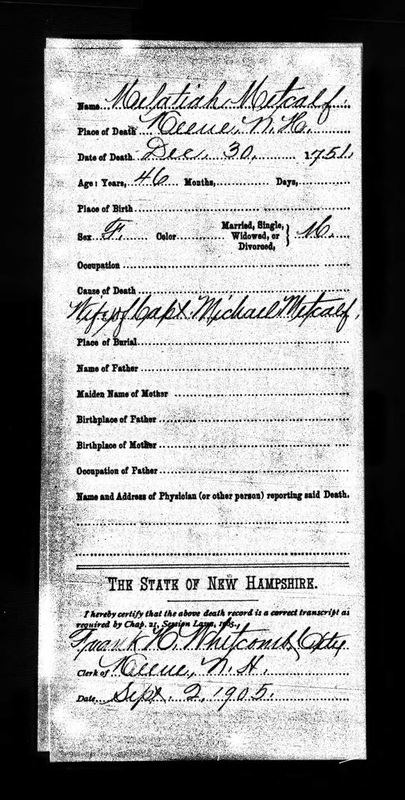 Manning M. Knapp (1823-1892) was the son of William and Sarah (Cutter) Knapp of Newton, New Jersey. He married Anna Maria Mattison (1827-1899) in 1850, and they had two children, Anna Watson Knapp (1853-1898), who married Walter V. Clark (1852-1898), and Joseph Mattison Knapp (1858-1895). 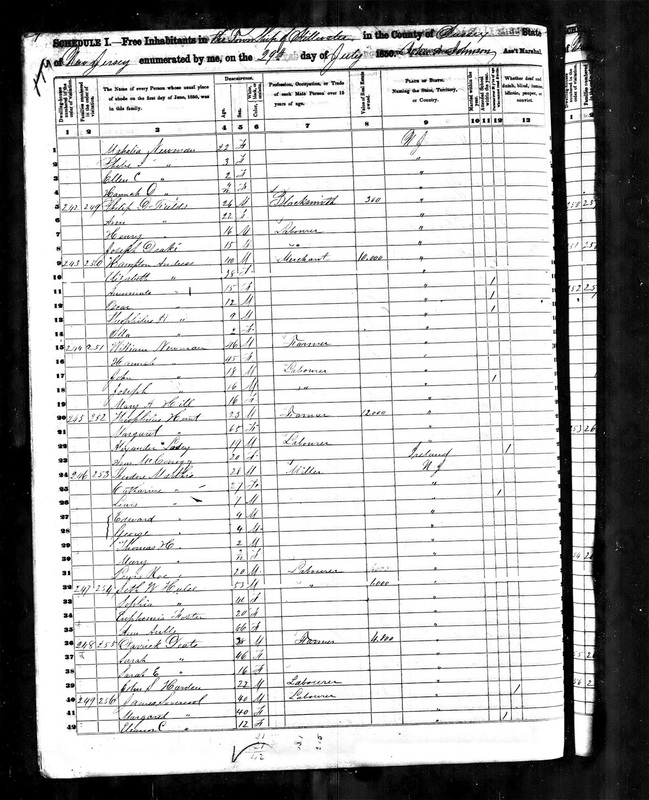 Manning M. Knapp was the brother of my second great-grandmother, Sarah Knapp (1818-1904), who married David Auble (1817-1894) in about 1844. So he is my 2nd great-granduncle. He is probably the most "important" and "famous" close relative I have. April 17, 2019—Boston, Massachusetts—American Ancestors and New England Historic Genealogical Society (NEHGS)—the oldest and largest genealogical society in America—today held the first of a series of events in the U.S. commemorating the 400th anniversary of the landing of the Mayflower with a festive ceremony at their headquarters on Newbury Street in Boston, Massachusetts. An imposing replica of the Mayflower, the ship that carried the Pilgrims to the new world in 1620, was christened the Boston Mayflower and placed in the organization’s front courtyard to commemorate the significance of the event in the nation’s history. Unveiled adjacent to it was an artistic tribute to the people and culture of the Wampanoag Nation, the Native Americans who met the Pilgrims after their arrival in Plymouth harbor. “The sailing of the Mayflower stands as an icon in American history. The Mayflower Compact was formative to our democracy. And we are just as committed to telling the Native American story,” said D. Brenton Simons, President and CEO of American Ancestors and New England Historic Genealogical Society. “As the largest nonprofit involved in the commemoration—with more than 260,000 members and millions of online users—we have a responsibility to educate people everywhere about this historic occasion,” Simons said. “We will carry out our work in many different ways—through events, tours, published scholarship, exhibitions, educational opportunities, and online research resources. We have had an important stake in telling this story since our founding in 1845 and we are dedicated to helping our members and the public connect to this important moment in American history,” he added. The Boston Mayflower is a large replica of the iconic, square-rigged, 17th century vessel, measuring 10 ft. long x 10 ft. 10 in. high, and was crafted by marine artist Terrance “Terry” Geaghan of Bath, Maine. Anchored at the main entrance to American Ancestors on Newbury Street—one of Boston’s most-traveled pedestrian streets—it is constructed of eastern white pine. The replica was christened by Nancy S. Maulsby, of Greenwich, Conn., Chairman of the Board of Trustees of American Ancestors and New England Historic Genealogical Society. In tribute to the Wampanoag people, an installation was unveiled by American Ancestors of a young Patuxet mother and child. Created by Steven Peters, creative director at SmokeSygnals, a Native American consultancy located in Mashpee, Mass., the piece depicts the tradition in which the Wampanoag people shared stories of family through the creation of intricately woven, beaded wampum belts. These belts included symbols that informed a narrative, recorded a treaty, or represented a legacy. Usually a collaboration of many tribal artisans, these most sacred belts were held by elders, spiritual leaders, and sachems and were often left unfinished for the story to continue. At the ceremonies on Wednesday, a new exhibit, Origins and Legacy of the Mayflower, was opened in the first floor gallery of American Ancestors. It explores the origins of the Mayflower migration and its lasting legacy and presents the story of the Mayflower—the quintessential American story—across four centuries, expressed through items drawn from New England Historic Genealogical Society. The exhibit complements the two art installations in honoring and learning from the enduring legacies of the Pilgrims and the Wampanoag. The art installations and the exhibit will be on view at the American Ancestors headquarters building through the end of the 2020 commemorative year. Individuals around the world can trace their genealogical ties to one of the 26 Pilgrim families known to have left descendants. It is estimated that there are more than 35 million people today who are descended from a Pilgrim. American Ancestors offers its expertise in researching and documenting that lineage through its website at AmericanAncestors.org and through specialized Mayflower products and services. A guest membership in American Ancestors is free and allows the member to research their family history online and to explore their own connection to the Mayflower story. 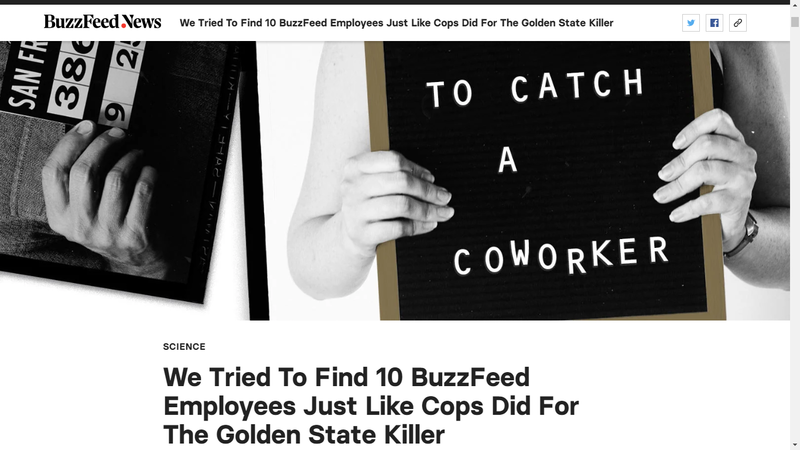 The New England Historical and Genealogical Society weekly newsletter, The Weekly Genealogist, highlighted an interesting article today about "We Tried To Find 10 BuzzFeed Employees Just Like Cops Did For The Golden State Killer" by Peter Aldhaus, published 9 April 2019. "How hard is it to crack cases in this way? And what issues does it raise, as police recruit genealogists to help them solve crimes by sifting through the perpetrators’ extended family trees?" The article goes on to describe the process they used to select ten employees, the process they used to try to identify those employees using their autosomal DNA test results submitted to GEDmatch, including obtaining genetic genealogy education from DNA expert Leah Larkin (The DNA Geek). They had decent success, identifying six of the ten employees through use of DNA matches, online trees, online genealogy research, and social media. An Auble cousin gifted me with a photograph album of her family several years ago which included quite a few photos of my grandmother, Emily Kemp (Auble) Carringer and her parents, Charles and Georgianna (Kemp) Auble. 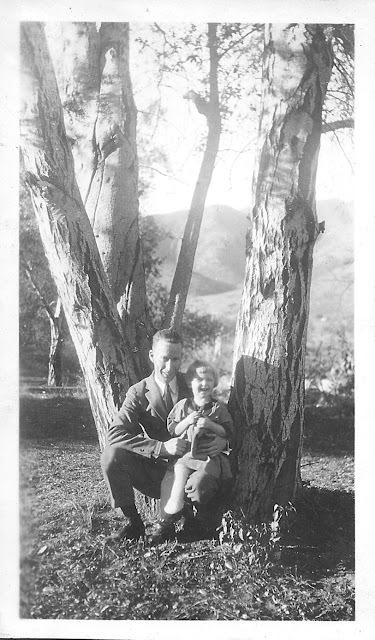 The two people in this photograph are Lyle L. Carringer (1891-1976) and his daughter, Betty Viriginia Carringer (1919-2002), my mother. They both look so happy! I don't have many photos of my mother laughing as a child. She was about three years old in this photograph. As was the custom, I think, adults went to the parks dressed up - a suit and tie in this case. According to the caption in the photo album, this was taken in El Monte Park (east of Lakeside in San Diego County) in 1922. My guess is that my grandmother, Emily (Auble) Carringer (1899-1977) took this photograph and passed it to Bessie Pentecost. Or, perhaps the Pentecosts were visiting, and Bessie or her husband took the photograph. Several years ago, while doing Auble research, a descendant of Will and Bessie (Auble) Pentecost contacted me and offered the album to me, telling me that it had many photographs of the family of my grandparents (Lyle and Emily (Auble) Carringer). I have kept the album intact in case she ever wants it back, but have digitized many of the photos of my Carringer and Auble families. Unfortunately, there were no photographs of the parents of Charles Auble, David and Sarah (Knapp) Auble of Terre Haute, Indiana. * Researchers Want to Link Your Genes to Your Income but Should They? 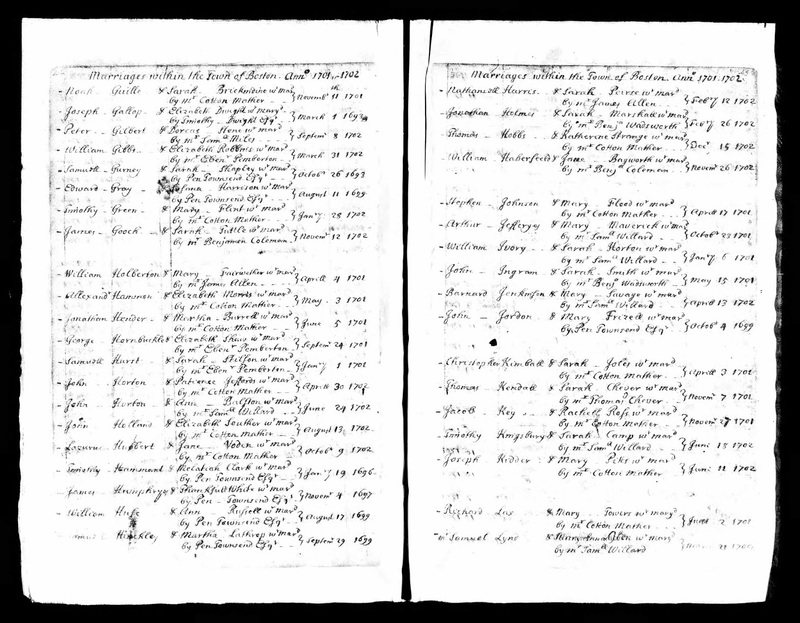 * New Genealogy Records Online for England, the Netherlands, & More! * DNA Family Tree YouTube: NEW! Ancestry DNA Beta Profiles! 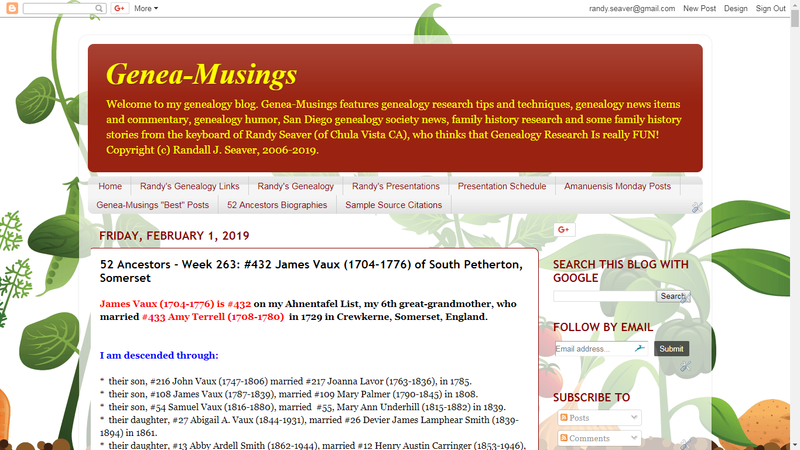 8) Did you miss the last Genealogy News Bytes - 12 April 2019? I think my last list of my Autosomal DNA test and analysis results was posted in Randy's Autosomal DNA Test and Analysis Summary - 18 February 2019. I decided to stop doing the update on a weekly basis, and I planned to do it on a monthly basis. Two months have passed...I need a calendar, apparently. * Highest match has 779 cM (11.5%), and is one of my known first cousins. 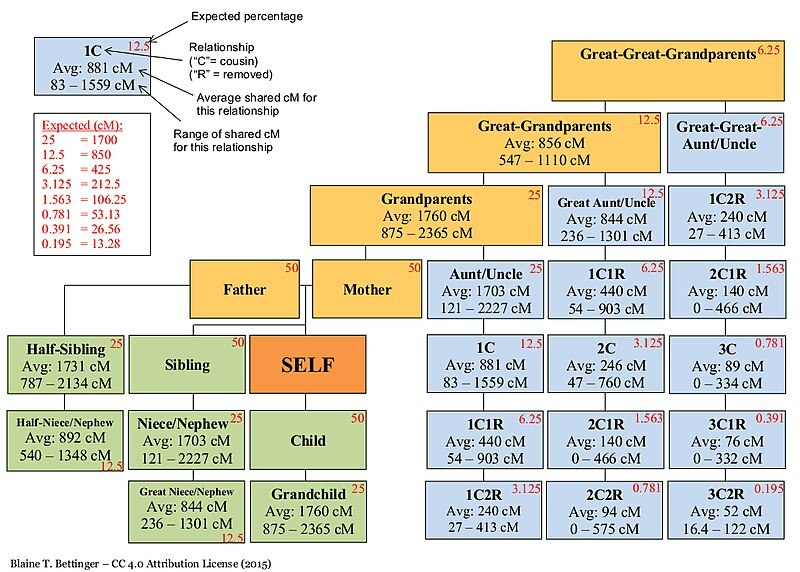 * Highest Match has 512 cM (7.1%), and is one of my first cousins once removed. * Highest Match has 112 cM (1.54%), and is an adoptee. 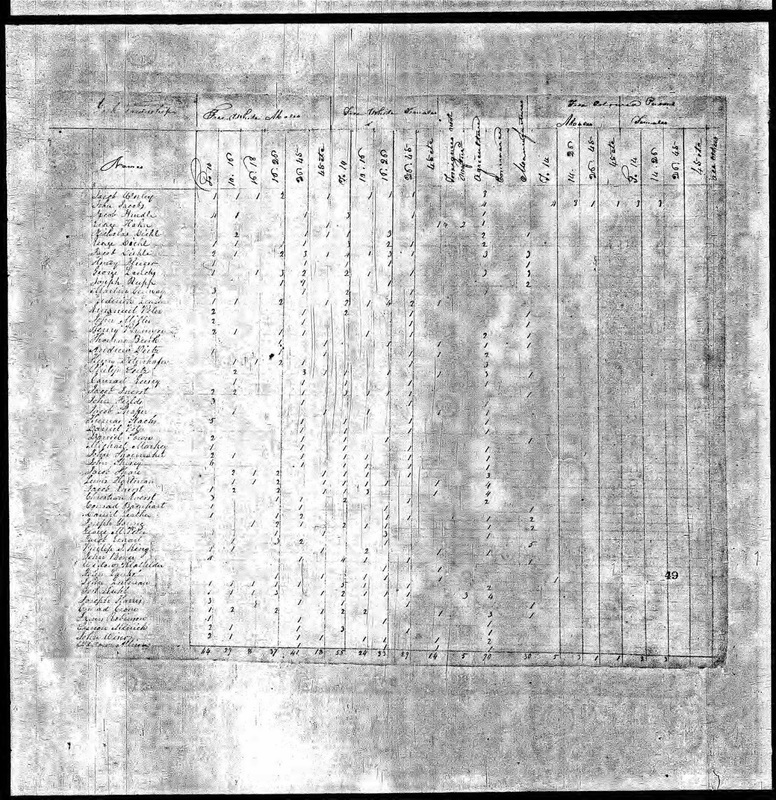 1820 United States Federal Census, Population Schedule, York county, Pennsylvania, York township, page 49, Philip J. 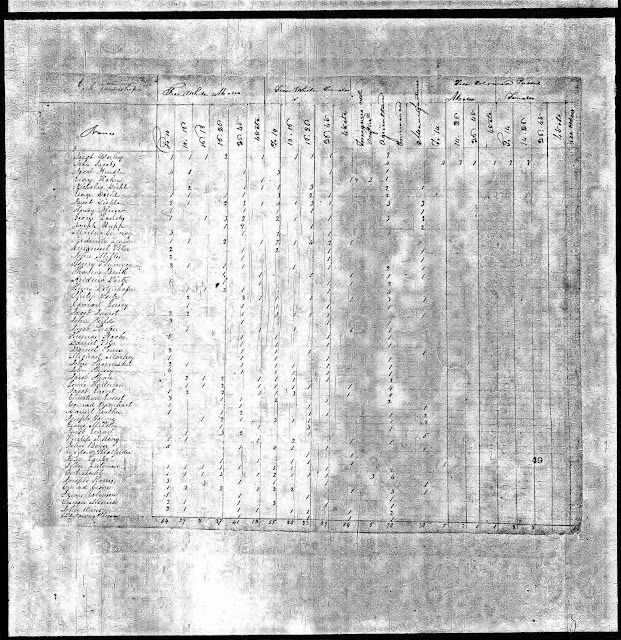 King household; digital image, Ancestry.com (http://www.ancestry.com); citing National Archives Microfilm Publication M33, Roll 114. 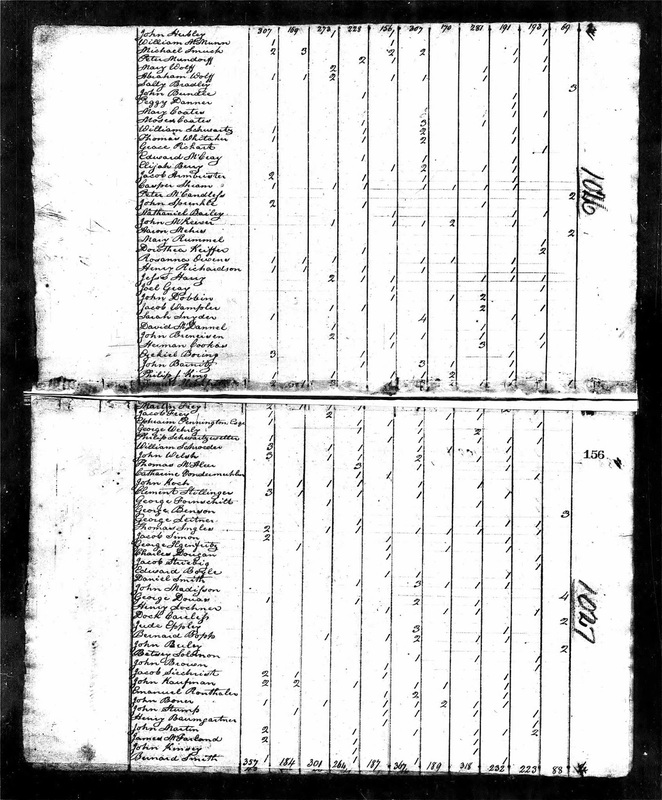 Four of the five youngest children are enumerated in this census. The older female is Christina (Miller) King, the second wife of Philip Jacob King; the first wife, Catherine (Ruth) King, died in 1813. Philip Jacob King (1764-1829) and his first wife, Catherine Ruth (1770-1813) are my 4th great-grandparents, through their daughter Elizabeth King (1796-1863), who married Daniel Spangler (1781-1851). 1) Moderated the Chula Vista Genealogical Society (CVGS) Research Group meeting on Wednesday at the Chula Vista library. I reported on the Ancestry profile revision, the inactive RootsWeb mailing lists, finding the Auble home photograph, and reviewing Leland photos and DNA with my brother-in-law. A guest had a problem with his Irish ancestry and we discussed that for a significant time. 2) Taught the second class of my "Beginning Computer Genealogy" class at OASIS (a senior adult education center) on Thursday. I have seven students eager to learn about genealogy and using the computer to find records and record family history. We covered the different types of records and online access to them, data entry in software programs (with demonstration in RootsMagic), using the LearnWebSkills site, and accessing commercial record repositories (with demonstration of Ancestry). 3) Attended the San Diego Genealogical Society (SDGS) meeting on Saturday, with speaker Kristi Sexton on Cemetery Records and Hunting Your Heritage. 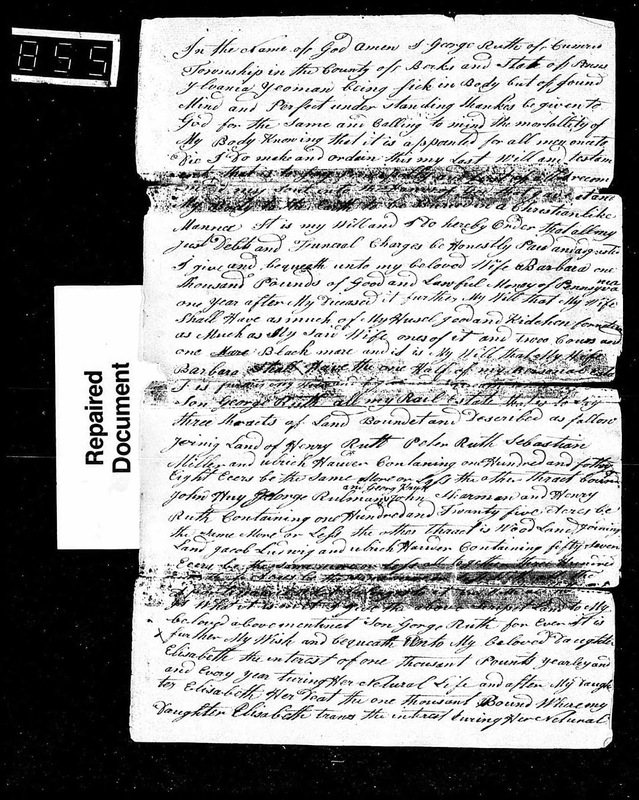 4) Found and transcribed the 1843 deed of 3rd great-grandfather Zachariah Hildreth for land in Townsend, Mass. to Samuel D. Baldwin for Amanuensis Monday. 5) Wrote and posted a biography of 6th great-grandfather #448 Andreas Abel (1690-1751) of Germany and New Jersey for my 52 Ancestors post on Friday. 6) Watched one Family Tree Webinar - Visualizing Ancestral Lines With DNA AutoClusters, by Ran Snir of MyHeritage. 7) Participated in today's Mondays With Myrt. Today's webinar discussed the Map Explorer in England on TheGenealogist website, finding cemetery information, using military cemetery sites, Candian veteran death records, sharing files in Dropbox and Sync, TheGenealogyShow, Debbie Parker Wayne's book, and Saskatchewan maps. 8) There were several sessions working in the RootsMagic software program to update FamilySearch Family Tree profiles for Seaver families and other ancestral families, with occasional additions to the RootsMagic profiles. I have matched 30,425 of my RootsMagic persons with FSFT. Updated and cleaned up the Family Tree profiles for three ancestors, including life sketches, sources and notes. 9) I continue to use Web Hints and Record Matches from Ancestry, MyHeritage, Findmypast and FamilySearch to add content and sources to my RootsMagic profiles. I now have 53,314 persons in my RootsMagic file, and 103,543 source citations. I TreeShared twice this week updating 310 profiles, and I resolved about 590 Ancestry Hints. I've fallen behind on the Ancestry Record Hints with 107,586 to be resolved, but I work on them weekly. 10) Several DNA cousins have contacted me this past week and we have shared tree information. I have added the family lines of 8 AncestryDNA matches to the RootsMagic database using ThruLines. 11) Baseball season started two weeks ago, and we have watched every game so far. The good news is that the Padres are 11-6 on the season so far, and in first place! 12) Wrote 18 Genea-Musings blog posts last week, of which one was a press release. The most popular post last week was Ancestry Announces Two Improved Features - User Profiles and Messages with over 2,596 views. It's Genea-Musings 13th Anniversary Today!